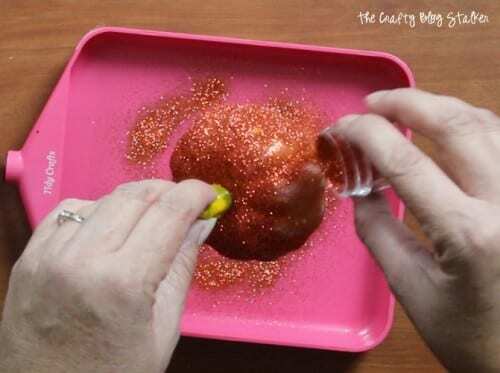 Learn how to glitter pumpkins. It is an easy and fun DIY craft. Add your glittered pumpkins to wreaths, centerpieces and more. You can make it! I love the colors of fall. I am fortunate to live close to the mountains and one of my favorite things to do this time of year is take a drive up through the canyons and look at all of the trees changing colors. It really is quite beautiful. The greens, reds, oranges, and browns are just breathtaking. The glitter colors I chose for my pumpkins are inspired by all of the changing colors of fall. I wanted to bring those colors indoor and enjoy them every day. This technique I am going to show you really will work on almost any type of surface you want the glitter to stick too. Since its fall, I chose pumpkins. I also have a video tutorial if you would prefer. If you like my video subscribe to my YouTube Channel so you don’t miss out on any future video tutorials! As soon as you are done painting on the Mod Podge shake on the glitter. Pour the glitter all over the pumpkin over the craft tray. I love craft trays because they make it so easy to collect all the glitter that doesn’t stick to your project and pour it right back into your container to use it again. This is a must-have tool if you like to use glitter. When all of the glittering is done, apply a clear coat. This will help the glitter adhere and less of it will fall off when handling. 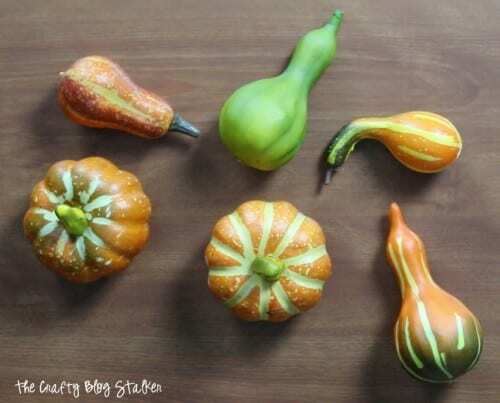 When the glitter pumpkins are completely dry you can add them to your fall decor. 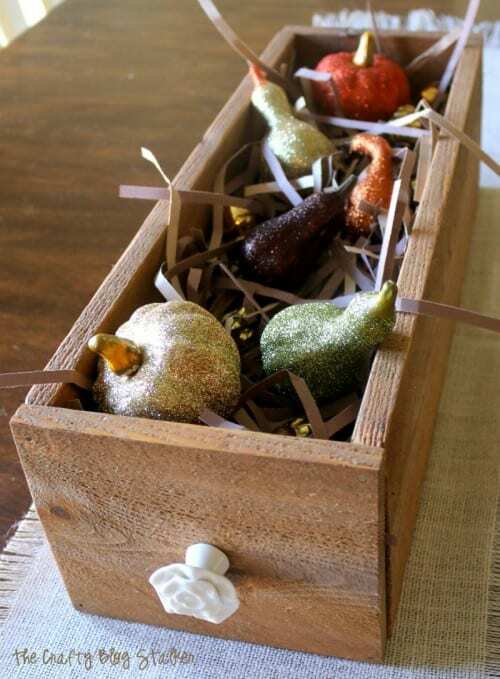 I put them inside of wood planter box centerpiece with some ruffled strips of paper and small gold ornaments. Here is a side view so you can see what it looks like as the centerpiece on my dining room table. I would love to know what is your favorite way to enjoy the fall season? Leave me a comment below. 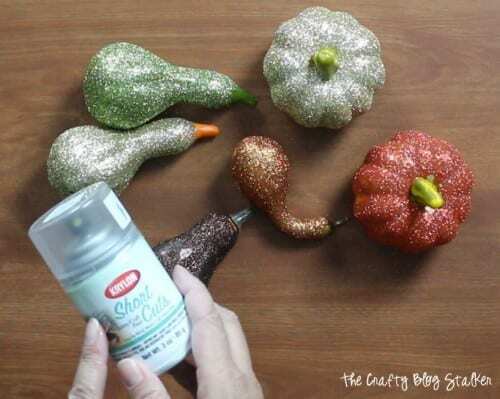 SAVE HOW TO MAKE GLITTER PUMPKINS FOR FALL DECOR TO YOUR FAVORITE PINTEREST BOARD! They are so pretty , I am assuming they are not real, so you can use them year after year? It’s hard to tell from the photos. 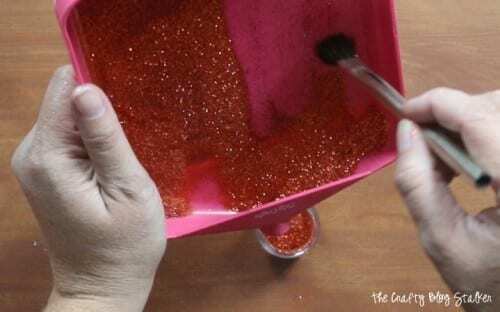 Great tips for dealing with glitter too! Popping over from Funtastic Friday =) Those are too stinking cute! Everything is better with glitter. I might have to get some of those trays. Come share your crafts, DIY’s, recipes & up-cycle posts at #2usestuesday (Mon PM to Fri PM) & your latest & greatest Pinterest pins at #Pinbellish (Fri AM to Tues AM) over at Sarah Celebrates if you don’t already! These are really cute! And I really need one of those trays!! Stopping by to pin from the Pin Me Linky party. Have a great weekend! Thanks for stopping by Vickie! I am glad that you like my decorations. The glitter pumpkins really are fun to make! Beautiful DIY!! Thanks for sharing at my DIY Crush Craft Party on Thursday!! I just pinned your entries. Thank you for the pin Denise! You are so welcome Lorraine! The trays really are amazing! 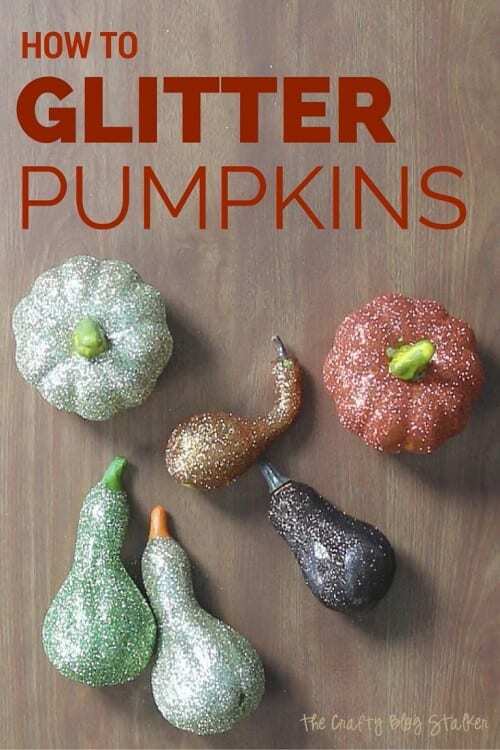 Just letting you know that you beautiful glitter pumpkin DIY got featured at my craft party!! Hope you will stop by again to link up your latest DIY! Oh these are so cool! I haven’t used glitter since I was a kid but you’d think with all the craft things I do I’d be all over it…maybe it’s a medium that needs to be re-introduced into my projects. I like that you could totally do this with kids! Thanks for linking up at Welcome Home Wednesdays! Very fun! Nothing like glitter to make everything better. Visiting from Monday Funday party. I totally agree, Victoria. A little bling makes everything better!